Equipping your car’s audio system with high-quality speakers is a great way of making the sound you’ll be getting better and more enjoyable. Big car speakers like the 6X9s are known to provide a good deal of bass. However, there’s a limit to the amount of bass these speakers and even smaller bass sources like the 8” subwoofers and 10” subwoofers can give. You are now looking for 12-inch subs because you need bigger, heavier bass and the speakers currently installed in your car cannot rise up to the task. It’s relieving to find a subwoofer that fits your requirements and one that is praiseworthy. All subs reviewed here are praiseworthy, but you are the one to determine if they fit your bill. A lot of research work was put into this review. Our sound engineers and expert installers teamed up with experienced reviewers and real users to provide unbiased and accurate content on different aspects of each speaker. That’s how we were able to provide you with in-depth subwoofer reviews that you’ll find highly useful in your search for the best 12 inch sub. We first performed a thorough market research to know which speakers are most preferred. From the research we got quite a huge number of well-performing subs. We focused our efforts on the best of each top-performing subwoofer brand, carried out numerous tests and incorporated diverse comments from team members to come up with this comprehensive review. Rockford Fosgate has always led the subwoofer market with bass systems that best match your lifestyle and passion for music. The P3D4-12 12-inch sub is where innovation and efficiency in sound production meets. The sub delivers a deep, aggressive bass and has stunning aesthetic features that will make your car’s interior more attractive. Big subwoofers usually heat up during high SPL conditions. Not the Rockford Fosgate P3D4-12 12-inch sub! With the anodized aluminum voice coil formers, this sub exhibits superior heat dissipation. The aluminum metal is like a heat-sink that quickly dissipates heat before it builds up on the voice coil. Louder sound but simpler installation: Rockford Fosgate sets the standard with the VAST technology. The P3D4-12 uses a VAST surround that significantly increases the effective radiating cone area. This means you get more sound from this speaker than from other models of the same size. Durable sub that can handle power up to 1200 watts: The P3D4-12 is a real sound horse. All the features are designed in the best way to ensure flawless production of more beefy bass notes and louder sound. Stitched tinsel leads create robust build: Lead wires are designed in the best way for high-quality sound performance. The multipoint stitched lead wire technique significantly reduces the wire’s mass and allows for the spreading of stress and strain over a bigger area, so that the leads can withstand fatigue, high current and extreme duty cycles. Passed industry standards: For the P3D4-12, the CEA-2031 certification means the sub can handle high power continuously. Listen to music at high volumes for many, many hours; and your voice coils will never get damaged. Our say: If you want to get the best value from your subwoofer installation, have this bass leader installed in your car. The P3D4-12 offers resounding bass, excellent sound quality and unrivalled heat dissipation. Go to Amazon and check out the P3D4-12. We think it’s the best of the best subs you can get today. Many of the 12-inch subs that passed through our review panel proved to be durable and portable. However, the flexibility of the TS-W3003D4 tickled the interest of many real users. Wire this subwoofer according to your needs: together at 1- or 4-ohm, or separately at 2 or 8 ohms – and see what you get. Impressive power capacity: Handling up to 2000 w of power, this sub is truly powerful. There’s no doubt about getting loud sound with this sub. It will kick out strong low frequencies for total enjoyment of your favorite tunes. Highly efficient in sound reproduction: The high sensitivity rating of 96 decibels puts this sub ahead of the pack. The sub is able to use power efficiently to produce sound. This makes it a good option if you want to hook up your low-powered car stereo with a powerful 12-inch subwoofer. Pioneer is the champion of high-quality, durable build designs: If you like elegant audio equipment, you will fall in love with Pioneer TS-W3003D4 at first glance. This heavy-duty 12-inch sub champions a rigid ribbed aluminum basket, a premium grade IMPP composite cone, and highly durable elastic dual layer polymer surround. Reputation of competition-level sound performance: Pioneer is universally known for its unmatched performance. This bass giant hits really hard. Just couple it with a powerful amplifier and thoughtfully-designed enclosure and you’ll be the guy everyone is talking about. Verdict: Pioneer TS-W3003D4 excellently balances quality, performance and aesthetics. It seems like a highly attractive option if you are looking for bigger bass and don’t mind having a big, heavy sub in your car’s trunk. We are sure you can find some unique value from this sub. See current price on Amazon. Earn the bragging rights for bass wherever you drive. With an RMS of 900w, Planet Audio’s best sub, the AC12D, rules the bass effortlessly. It’s designed with different enclosure types in mind but one thing doesn’t change: it is a bass beast. See its powerful features below. Enhanced audio quality: The AC12D sports a polypropylene injection cone and foam surround. The least you can expect from this combo is improved quality of the sound produced by your car stereo. Excellent lows at high volumes: The AC12D is designed for those who want to make a premium car audio system. It uses a dual voice coil that helps to deliver plenty of punch at all volumes. This powerful bass performance is enhanced by the sub’s high RMS of 900w. Choose what type of bass you want: This sub thrives well both in a ported and sealed enclosure. If you are looking for greater SPL output and thumping bass, fit the sub in a ported enclosure and make sure the amplifier has a subsonic filter. For solid, tight bass, use a sealed enclosure. Can be installed in a wide variety of vehicles: The subwoofer has a resonance frequency of 32Hz and is small enough to be fitted in cars of different sizes. So, there is nothing to worry about the size of the sub no matter the type of car you have. Our say: This sub comes with outstanding features and you don’t have to be an expert to install it. We think it a great bang for your buck especially if you want greater bass at higher volumes without roughing up your budget. Order Planet Audio AC12D today and start ruling the bass wherever you drive. What does Kenwood mean to you? Power, reliability, high-quality sound, and attractiveness are what you get from Kenwood KFC-W3016PS. The sub is one of Kenwood’s Performance Series subs. It comes with nothing less than a promise of punchy, reliable bass in your car. Let’s get deeper into the specs of this award-winning 12-inch subwoofer. Earth-shaking maximum power handling: KFC-W3016PS 2000W MAX power rating ushers you into party mood even when driving. Most of the real users who had a chance to test this sub loved its heavy and solid bass. With KFC-W3016PS, your long journeys will change from boring to total enjoyment. Square Array Pattern helps to ensure the cone is protected from warping to facilitate continuous heavy bass production. A dual ventilation system adds even more protection to the sub. It helps to get heat out of the motor structure so that the speaker gives out those pleasurable long, loud jams. Rich, high-quality audio: The sub can handle extra-long cone excursion thanks to the heavy-duty polypropylene cone that is reinforced with tough rubber surround. Superior audio performance is also enhanced by the over-sized diaphragm and 4-ohm voice coil with an 8 AWG push terminal. Dual ventilation system and ‘Stress-free spider’: These two features work together to enhance the mechanical durability of the sub and allow for the release of heat from the motor so that the sub performs optimally for long duration. Good low-frequency output: The KFC-W3016PS is designed in such a way that the area of the cone is increased while maintaining a constant cutout diameter. This design is aimed at making it easier for the sub to achieve great lows. Our say: Take advantage of Kenwood’s decades of extensive experience in building market leading subs. The KFC-W3016PS 12" sub is a sure bet to more powerful and reliable bass in your car. Upgrade your sound system with KFC-W3016PS and you’ll love its design and performance. Pyle is slowly becoming the go-to place for a wide range of electronics. The brand has endowed the car audio market with a rich collection of subs that enrich your media experiences on the go. For the 12-inch subwoofer category, Pyle presents the PLPW12D 1600W dual 4-ohm sub, built with top notch technology to revolutionize your car stereo’s sound. It is exceptionally loud and powerful: A power handling of 800w RMS tells you that the PLPW12D doesn’t make a joke out of the power it gets. With a sensitivity of 90dB, a 60 Oz magnet and double layer 4 Ohm voice coil, expect quite superior sound volume and great lows at all volumes. Accurate and distortion-free sound production: As you know, the audio performance of any speaker largely depends on the cone design and material. Pyle PLPW12D champions a non-press paper cone that enables it to produce crystal-clear sound that doesn’t have the slightest trace of distortion. Outstanding speaker construction: A specially treated foam surround has been used to build this sub. The surround works seamlessly with the paper cone to deliver high-quality bass and better overall sound. Using foam surround is also aimed at improving the durability of the sub. Rigid and sturdy steel basket is used to offer the best protection for the interior of the sub. In addition to the basket being highly durable and reliable, it also makes it possible for the sub to be installed in a wide selection of locations inside the car. The exterior of the speaker is outstanding. Verdict: This intelligently engineered premium-quality sub is functionally able to deliver lows that add a pleasurable hue to your audios. It’s a great addition to a stereo that needs a highly efficient bass-focused driver. Check price on Amazon and seize the opportunity to upgrade your car stereo. We thought we had exhausted everything about bass production until the EVL-12 D2 provided us with a sneak peek of the unique value offered by the Skar Audio EVL series of subs. Viewed from any angle, this sub features an array of distinctive features that enable it to handle low frequency notes with authority. Blow the car roof off with loud sound: Yes! This sub is among the most powerful we have come across during our recent subwoofer reviews. What can you do with 2500w of power handling capability? Think about that as you explore more about SkarAudio EVL-12 D2. Does this sub heat up during high power performance? Before buying such a powerful sub, you would probably want to know how it handles heat. During extended high power sound performance, the Audio EVL-12 D2 still remains cool thanks to the high-temp, 4-layer aluminum voice coil and the advanced cooling design. A flawless, riveting bass response: If you’ve experienced Skar before, you’d be looking for EVL’s signature spider design, high-temp coil, premium stitched wires and competition-level cone when you lay hands on this sub. Surely, you’ll find these features working together to producing a uniquely clear, articulate and deep bass. A heavy-duty double stack magnet ensures that the voice coil moves efficiently for precise sound response. The big, high-grade magnet is well matched with other heavy performance features to ensure that the sub produces the loudest sound and the biggest bass possible. Our view: If you are here for a powerful 12” sub that will turn your car into a bass powerhouse, suit yourself with Skar Audio EVL-12 D2. It’s the best you’ll get around. Enjoy harder kicks on your favorite tunes with the EVL-12 D2. You only have a little trunk space left for subwoofer installation. Are you wondering where to get the best 12-inch sub for some low-end muscle in your music? This Kicker sub will kick big bass from the trunk to the entire car. It’s compact, powerful and highly efficient. Maximum performance for all kinds of music: The 44DCWC122 comes with a rugged ported enclosure, which is the perfect enclosure design for this kind of subs to produce big bass. You will enjoy every jam in your playlist as this vented box does some magical sweetening of any tune that goes through the speaker system. Reliable for extended performance durations: Some subs give up amid heavy bass performance. Kicker has done everything to make sure there isn’t even the slightest chance of this happening while you use the 44DCWC122. That’s why a ribbed foam surround is used to promote long excursion and keep the flex-resistant cone on target. Built to last: Whoever put up the subwoofer box had the best idea of durability in mind. Solid wood and nice gray carpeting on top has emerged to be one of the most impressive enclosure designs. The speaker itself is also built with tougher material than those found in most subwoofers. Mind-blowing sensitivity: Everybody takes note of the high sensitivity of this Kicker sub model. 99.9dB is way higher than most speakers in our review. This sub is the best match for a low-powered car audio system since it can use the little available power to produce big beats. Order Kicker 44DCWC122 and have monstrous bass rolling out of your stereo immediately after unboxing it. Still looking for a smaller sub that adds packs of punch? American Bass XFL1244 is for the people who cannot compromise on their love for music. 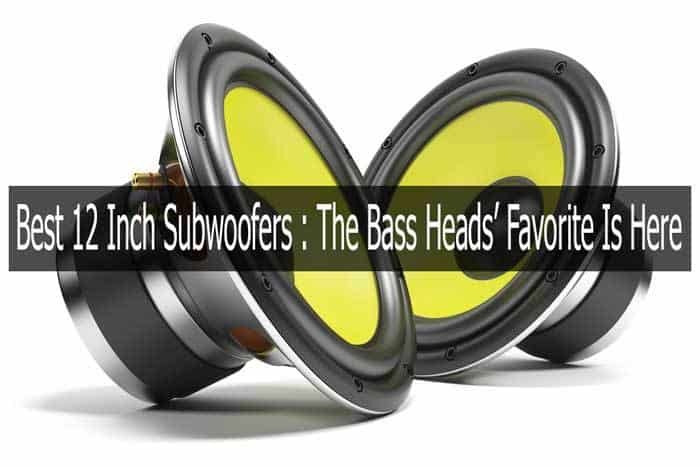 Its extra strong construction and great sonic capabilities landed a place among the best subs 2019. Even the most demanding sound enthusiast finds the XFL1244 satisfying. What features makes the XFL1244 the best? First, the weight of the sub while in the package will give you a rough idea of the kind of no-joke subwoofer you are just about to experience. This thing weighs around 35 pounds; American Bass was not going to fool you around with heavy weight and no bass. Just test it and verify. Reputation of distortion-free loud bass: American Bass subs are well known for giving out low and loud bass notes. Our lab tests found out that the sub can handle extreme amounts of power. Combining this power capability with other design features, we confirmed that the sub is really reliable for bass production. Built to hit really hard and remain intact: Meet the most robust subwoofer design in this model. An aluminum voice coil is attached to a three layer progressive spider that connects to the suspension. The spider diameters are anchored to the woofer frame via a synthetic spider landing. You can only find such a robust design in best performers like the American Bass. High-excursion abilities: A continuous power rating of 1000 watts is exceptional and requires a proper plan for heat handling. The XFL1244 uses a 3-inch copper coil wound on an anodized former for improved heat dissipation. A strong cast aluminum basket and anodized motor assembly also help to handle heat. Verdict: This sound beast is reasonably priced and we think it is a perfect choice if you are searching for high power handling and above average sonic performance. Don’t spend too much to get hard-hitting bass and better sound performance. Check out the American Bass XFL1244 on Amazon. JL Audio combines a number of patented technologies to achieve great efficiency, excursion and linearity. Its power handling may be lower than the majority of competitor subs but its performance speaks for itself. Let’s review some of the features that make the 12W0V3 an attractive option. Generous amounts of excursion with large roll surround: Being part of the W0V3 series, this sub sports a rigid polypropylene cone that is highly resistant to flexing. This cone is able to withstand extra-long excursion thus allowing the sub to hit deep without distortion of low notes. Elevated frame helps to cool the voice coil: Another distinguishing aspect of the JL Audio 12W0v3 sub is the use of advanced cooling systems throughout the subwoofer frame. The Elevated Frame Design, in particular, is a big plus for the sub as it improves power handling and heat dissipation significantly. Long-lasting materials: The hefty 2” voice coil, durable foam surround, and mineral-filled polypropylene cone assure you that your sub is strong enough to deliver top-notch performance even under extreme conditions. In addition, the subwoofer is designed to work in sealed or ported enclosures, and there’s an option to add a grill for more protection. Tight, clean, articulate basswith DMA optimized motor: JL Audio 12W0V3 sub features JL Audio’s proprietary DMA (Dynamic Motor Analysis) system that’s majorly responsible for reduced distortion. All transients are reproduced faithfully and that is why you get a tight, clear, precise bass from this sub. Verdict: The 12W0V3-4 is well built despite its low power output. The subs can give out a thumping bass and bring a big impact to your sound. Choose the 12W0V3-4 for bass that shakes the ground. The Audiopipe TXX-BD2-12 subwoofer came in at number 10 because of its good performance and affordability. Our tests showed that its 750W RMS is enough to satisfy just about any bass lover out there. The sub’s nice features, a wide frequency range, and enhanced durability convinced us that it rightfully belongs to the class of best 12 inch subwoofers 2019. Get Audiopipe’s best subwoofer for hard hitting bass: The TXX BD2 12 is built for serious audiophiles who want nothing but the best sub for bass. It’s almost obvious that with 750w RMS and 1550w MAX powerratings, this sub will blast heavy hits out of your trunk. High reliability: Once in a while, someone is lucky to find a high-quality, absolutely reliable subwoofer whose price is unbelievably affordable. This is the case with Audiopipe TXX-BD2-12, which features a 150-Oz double stacked strontium magnet and 2.5-inch dual 4-ohm voice coils for reproduction of clean and detailed sound. Audiopipe pushes the frequencies lower for deeper bass notes: This sub has a frequency range that sets it apart from the rest of the competition. 20 – 900Hz is quite impressive, but the key benefit here is how low the sub takes the bass notes. You are sure to get very deep kicks especially if you find a perfect enclosure for the sub. Powdered black cast aluminum basket = high durability and elegant look: The sturdy basket does not only complement the great looks of the sub but also enhances its durability. Thus, the TXX-BD2-12 upgrades your stereo’s sound performance and makes the car’s interior more attractive. Verdict: Audiopipe TXX-BD2-12 hits the spot for music enthusiasts who are keen on getting a great deal of value for their investment in a 12-inch sub. Have these subs in your car and enhance your passion for great music. There are many types of speakers that you can install in your car to have the desired listening experience while on the road. You need something bigger and stronger, and you think a 12-inch sub fits the bill. Now, you will have to compare different specifications to ensure that you end up with the best 12” sub. The discussion about subwoofer power is multi-dimensional. There is the question of: can the existing audio system adequately power my new subwoofer? 12-inch subs consume different amounts of power to produce varying amounts of bass. If you want a sub that produces a lot of bass, know that it’ll consume a lot of current. Your audio system should, therefore, have power abilities close to that of the sub. The other important consideration about power is how much power the sub can actually handle. In some reviews, you’ll see complains of voice coils smoking,or the sub heating up or burning because too much current was driven through them. It’s crucial to determine the real power handling capabilities of the sub before putting it in the shopping cart. Unfortunately, there are subs that promise high power handling in words but they don’t deliver. Does it have a motor cooling mechanism? When you decide that you’ll go for a high-power 12-inch sub, look for the ones with a motor cooling system. Such a system makes sure that the sub doesn’t heat up and/or break down during long hours of application. Although the question of single and double voice coils is crucial, it is rarely explained well. First, the choice between SVC and DVC depends on what you want from your subwoofer. So, we cannot say which is better between a single voice coil sub and a DVC one. If your main concern is how much power the sub will put out, consider the ohm load of the voice coil rather than the number of coils. Ohms measure electrical resistance and the less the ohms, the more power the sub puts out assuming a constant power supply. You could be looking for flexibility; that is, you care about wiring options and intend to attach additional drivers to your stereo system. In this case, a DVC subwoofer is better than a SVC sub. How does your budget look like? It’s more likely than not that you are shopping for a 12-inch sub on a budget. To make your selection task easier, classify the available subs into two groups: the ones that are within your budget and those that rough it up. It’s good to stick to your budget since after purchasing the sub you might need to spend more money on a good enclosure or on installation. Do you want to install the sub or have it professionally installed? Is the seller offering free installation? Most subwoofers are easy to install but you might come across a 12-inch that could make you sweat. It’s good to know beforehand about a sub’s installation. Look at the installation manual and be sure you can handle the wiring steps if you intend to do it yourself. Other inevitable considerations include the weight and size of the sub and the required enclosure. Can the sub fit in the available space in your car? We are sure you will find one or several of the top 12 inch subs reviewed above perfect for your listening needs and matching your car’s existing audio system. Rockford Fosgate P3D4-12 has a very robust build and this makes it reliable for loud sound and superior bass production. The sub’s heat dissipation is outstanding so you have zero worries that it might heat up or suffer a thermal breakdown. The P3D4-12 can withstand high power applications for longer than the majority of equally sized subs. Its power handling of 600w RMS is quite impressive too. And what do you pay for this top-notch sub? The price is very reasonable compared to other high-performing subs in this review and on the market. This is our pick. What’s yours?